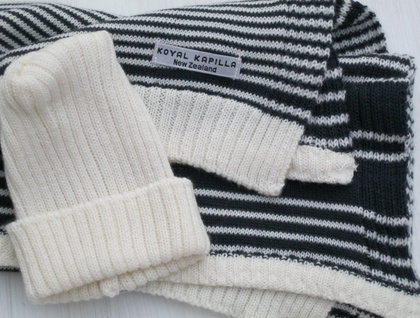 Unbleached fine Merino (rich cream) and Steel (dark blue grey) stripe knitted baby blanket wrap and hat. Striking colour way and Exremely Soft, warm luscious fibres with a lovely handle. Being a knitted blanket wrap, it is nice & stretchy to wrap your wriggly precious baby in snuggly. ESPECIALLY DESIGNED to use in bassinetts, prams, strollers or just to have handy in your car for travelling or baby bag. Extremely versitile and great for swaddleing or as small blanket where ever you are. These make great travelling blankets because of it's size especially in buggies & carseats.